RAWLAPINDI (92 News) – An eight-member team participating in the Special Olympics called on COAS General Raheel Sharif at General Headquarters on Thursday. The team had won three gold, four silver and three bronze medals in various events of Special Olympics at Los Angeles in July this year. 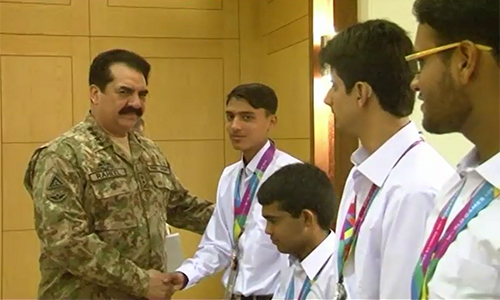 Lauding the performance of the athletes, COAS General Raheel Sharif said the nation was proud of the heroes.